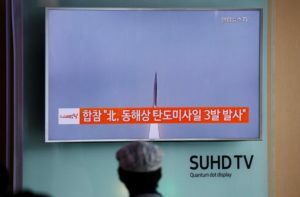 North Korea decided to make its mark on the G20 Summit by firing three medium-range missiles into Japan’s air defense identification zone on Sept. 5. Pyongyang’s move led to a rare face-t0-face meeting between Japanese Prime Minister Shinzo Abe and South Korean President Park Geun-Hye, who met on the sidelines of the summit after news of the missile launches broke. The leaders of two nations strategically allied with the United States but beset by historical resentments dating from Japan’s occupation of Korea last century, agreed to cooperate on monitoring the situation a Japanese statement said. The Rodong-class missiles were fired from a region south of the capital Pyongyang just after noon local time and flew about 1,000 kilometers (600 miles), hitting Japan’s air defense identification zone, the South’s Office of the Joint Chiefs of Staff said. The latest missiles launched by the Kim Jong-Un regime also came just hours after Park had met with Chinese President Xi Jinping on the G20 sidelines in Hangzhou. A Yonhap report said that Park had told Xi that the North’s fourth nuclear test and its ballistic missile launches this year threatened regional peace and posed a challenge to South Korea’s ties with China. Xi is said to have reaffirmed China’s commitment to the denuclearization of the Korean peninsula, China’s state news agency Xinhua reported on Sept. 5. Park said that a THAAD deployment would not threaten any other country’s security interests and would not be needed if the North’s nuclear issue was resolved, Yonhap reported.